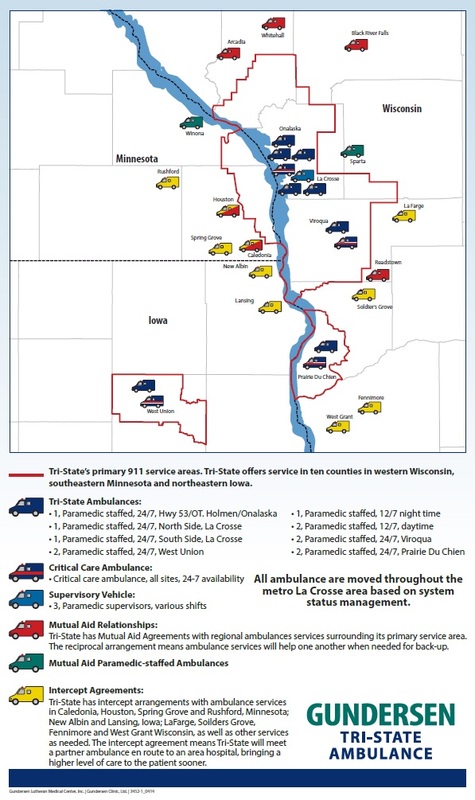 Tri-State Regional Ambulance – Tri-State Ambulance provides high-performance emergency medical services to Wisconsin, Minnesota, and Iowa. Proudly serving Southern Wisconsin and Northeast Iowa since 2011, Tri-State Regional Ambulance provides the most advanced pre-hospital patient care available, to thousands of patients every year. With a dedicated staff of highly skilled Paramedics and experienced EMTs, our company is able to provide emergency response and inter-facility medical services 24-hours a day. As the sole provider of 911 response to an area of nearly 1,000 square miles covering parts of two states, it is our responsibility to provide the utmost in quality and responsive patient care. Initiatives such as focused staff training and consolidated medical direction contribute to an impressive cardiac arrest survival rate. Clinical benchmarks assure our quality patient care remains highly effective. As a non–profit agency, Tri–State Regional Ambulance is able provide advanced life support service with no taxpayer subsidy. We are able to achieve this economic efficiency by flexibly staffing ambulances using 12 and 24 hour shifts to match ambulance staffing based on predicted call volumes and by seamlessly providing ambulance service across our diverse service area without regard to geopolitical boundaries. Proudly caring for our communities and families with compassion, innovation, and excellence. We strive to be regionally respected and nationally known for the provision of innovative care.